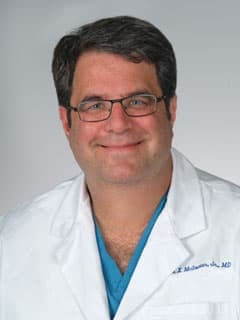 Francis X. McGowan, Jr., MD, is a cardiac anesthesiologist, holder of the William J. Greeley Endowed Chair in Pediatric Anesthesiology and Critical Care Research, and Director of Research for the Department of Anesthesiology and Critical Care Medicine at Children's Hospital of Philadelphia. Graham EM, Taylor SN, Zyblewski SC, Wolf B, Bradley SM, Hollis BW, McGowan FX, Atz AM: Vitamin D status in neonates undergoing cardiac operations: relationship to cardiopulmonary bypass and association with outcomes. J Pediatr 162(4): 823-826, 2013. Sun LS, Li G, DiMaggio CJ, Byrne MW, Ing C, Miller TL, Bellinger DC, Han S, McGowan FX: Feasibility and pilot study of the Pediatric Anesthesia Neurodevelopment Assessment (PANDA) Project. J Neurosurg Anesth 24: 382-388, 2012. Niklova A, Ablasser K, Wyler von Ballmoos MC, Poutias D, Kaza E, McGowan FX, Moses MA, del Nido PJ, Friehs I: Endogenous angiogenesis inhibitors prevent adaptive capillary growth in left ventricular pressure overload hypertrophy. Ann Thorac Surg 94: 1509-1517, 2012. Mehta NM, Costello JM, Bechard LJ, Johnson VM, Zurakowski D, McGowan FX, Laussen PC, Duggan CP: Resting energy expenditure after Fontan surgery in children with single-ventricle heart defects. J Parenter Enteral Nutr 36: 685.692, 2012. Kheir JH, Scharp LA,, Borden MA, Swanson EJ, Loxley A, Reese JH, Black K, Velazquez LA, Walsh BK, Mullen KE, Graham DA, Lawlor MW, Brugnara C, Bell DC, McGowan FX: Oxygen gas-filled microparticles provide intravenous oxygen delivery. Science Transl Med 4 (140): 140ra88, 2012. Graham EM. Atz AT, Gillis G, DeSantis S, Haney AL, Deardorff RL; Uber WE, Reeves RT, McGowan FX; Bradley SM, Spinale FG: Differential effects of aprotinin and tranexamic acid on outcomes and cytokine profiles in pediatric cardiac surgery. J Thorac Cardiovasc Surg 143: 1069-1076, 2012. Salvin JW, Scheurer MA, Laussen PC, Wypij D, Polito A, Bacha A, Pigula F, McGowan FX, Costello JM, Thiagarajan RR. : Transfusion following pediatric cardiac surgery is associated with prolonged hospital stay. Ann Thorac Surg 91: 204-210, 2011. Goobie SM, Meier PM, Pereira LM, McGowan FX, Prescilla RP, Scharp LA, Rogers GF, Proctor MR, Meara JG, Soriano SG, Zurakowski D, Sethna NF : Efficacy of tranexamic acid in pediatric craniosynostosis surgery: a double-blind, placebo-controlled trial. Anesthesiology 114: 862-871, 2011. Chow M-J, He H, Zurakowski D, McGowan FX, Zhang KY: Obstruction-induced pulmonary vascular remodeling. J Biomechan Engin 133: 1110-1-1110-9, 2011. Sun LS, Li G, Byrne M, Ing C, DiMaggio CJ, Miller T, Bellinger D, Han S, Roh A, McGowan FX: Pilot study of the pediatric anesthesia and neurodevelopment assessment (PANDA) project. Anesthesiology Page: A141, 2012. He H, Poutias DN, Favre E, Balschi JA, McGowan FX: Upregulation of NOX4 triggers mitochondrial dysfunction during the progression of infant right ventricular hypertrophy. Circulation 126: A13534, 2012. McGowan FX, Mukherjee R, Campbell P, Friehs I, Poutias DN, Baicu C, ZileMR, Spinale F, He H: Myocardial matrix dysregulation occurs in early in infant right ventricular pressure overload. Circulation 124: A15911, 2011. Kussman B, Laussen P, Benni P, McElhinney D, McGowan F.: Validation of the FORE-SIGHT tissue oximeter for somatic oxygenation in children. Anesthesiology Page: LBC01, 2011. Kheir JN, Black K, Reese J, McGowan FX: Lipid-based oxygen microparticles do not change in size following intravenous or intraosseous injection. Circulation Page: A259, 2011. He H, Kawata M, Poutias DN, Campbell PH, Ablasser K, Friehs H, McGowan FX: AMP-activated protein kinase-dependent autophagy in the transition of right ventricular hypertrophy to failure. Circulation 124: A13638, 2011. Kussman BD, McGowan FX: Anesthesia for patients with congenital heart disease undergoing non-cardiac or non-cardiopulmonary bypass procedures. Smith's Anesthesia for Infants and Children (8th Edition) Davis PJ, Claddis FC, Motoyama EK Philadelphia: WB Saunders (8th Edition) 2011;pp674-712 (eds.). Philadelphia: WB Saunders, Page: 674-712, 2011. DiNardo JA, Shukla AC, McGowan FX: Anesthesia for pediatric heart, lung, and heart-lung transplantation. Smith's Anesthesia for Infants and Children (8th Edition). Davis PJ, Claddis FC (eds. ), (eds.). Philadelphia: WB Saunders, Page: 605-673, 2011.
del Nido PJ, McGowan FX: Surgical approaches and cardiopulmonary bypass for congenital heart surgery. In Sabiston and Spencer Surgery of the Chest (8th Edition). Selke FW, del Nido PJ, Swanson SJ (eds.). Philadelphia: WB Saunders, Page: 1709-1733, 2010. Shukla AC, Steven JM, McGowan FX: Cardiovascular physiology and pharmacology in children. A Practice of Anesthesiology for Infants and Children (Fourth Edition) Cote CJ, Lerman JR, Todres ID (eds.). Philadelphia: Elsevier, Page: 361-397, 2009. McGowan FX, del Nido PJ: Surgical approaches and cardiopulmonary bypass for congenital heart surgery. Sabiston and Spencer Surgery of the Chest (7th Edition). Selke FW, del Nido PJ (eds.). Philadelphia: Elsevier, Page: 1825-1850, 2005. Shukla AC, McGowan FX. : Anesthesia for pediatric heart, lung, and heart-lung transplantation. Smith's Anesthesia for Infants and Children (7th Edition). Davis PJ, Motoyama EK (eds.). Philadelphia: WB Saunders, 2005. McGowan FX, Steven JM. : Cardiovascular Physiology and Pharmacology in Children. In: A Practice of Anesthesiology for Infants and Children. Cote CJ, Todres ID, Ryan JF, Goudsouzian NG (eds.). Philadelphia: WB Saunders, Page: 353-389, 2001. Steven JM, McGowan FX: Neuraxial blockade for pediatric cardiac surgery: lessons yet to be learned. (Editorial). Anesth Analg 90: 1011-1013, 2000. Burrows FA, McGowan FX: Neurodevelopmental consequences of cardiac surgery for congenital heart disease. Pediatric Cardiac Anesthesia. Greeley WJ (eds.). Philadelphia: Lippincott, Page: 136-174, 1996. Chan KH, Riding KH, McGowan FX, Stool SE: Endoscopic Surgery of the Upper Aerodigestive Tract. Atlas of Pediatric Otolaryngology. Philadelphia: WB Saunders, Page: 419-445, 1994. McGowan FX, Bailey P: Anesthesia for heart, heart-lung, and lung transplantation. Transplantation Anesthesiology. Cook DR, David PL (eds.). New York: Raven Press, Page: 85-157, 1994. McGowan FX, Snelling LK, Zucker HA: Case 40. Case Studies in Pediatric Intensive Care. Rogers MC, Helfaer MA (eds.). Baltimore: Williams and Wilkins, Page: 269-274, 1993. McGowan FX. : Anesthesia for Major Head and Neck Surgery. Anesthesia for Ophthalmic and Otolaryngologic Surgery. McGoldrick KE (eds.). Philadelphia: WB Saunders, Page: 64-89, 1991. McGowan FX, Chlebowski S: Renal and Endocrine Disorders The Pediatric Anesthesia Handbook. Bell C, Hughes C, Oh TH (eds.). St. Louis: Mosby Year Book, 1990. McGowan FX, Wagner GS. : The Electrocardiogram in Chronic Lung Disease. In: Pulmonary Heart Disease. Boston/The Hague. Rubin LJ (eds.). Martinus/Nijhoff, Page: 117-134, 1984.